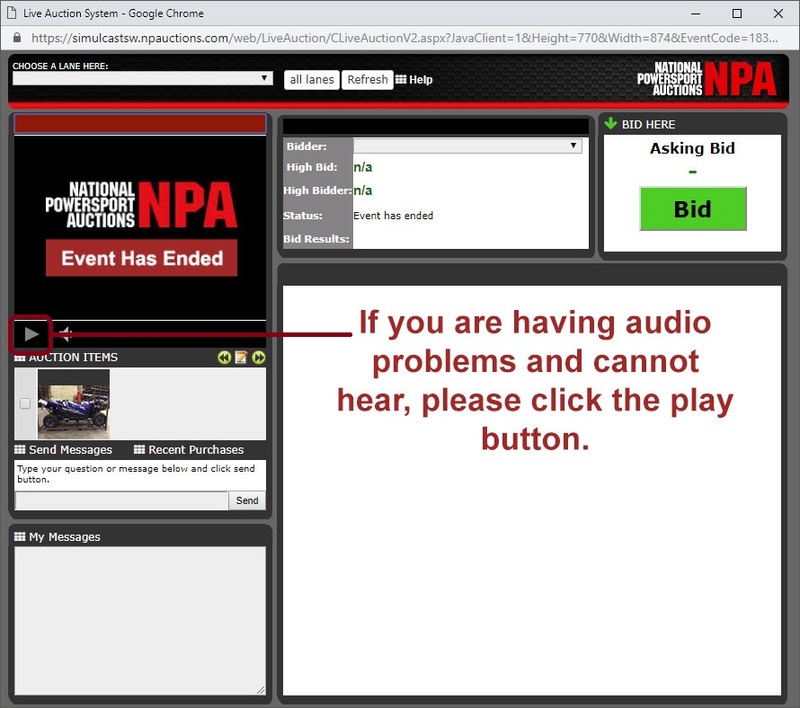 We're sorry - no auction information is currently available. Please contact us if you have any questions or want to find out more about our auction schedule. 1. Auction Lane Dropdown - Ability to select a specific auction lane. 2. Image/Audio Box - Displays image and item number. Also offers an audio check box to turn sound on and off. 3. Auction Lane Items - Lists the upcoming auction items for selected auction lane. 4. Message Block - Send a message to the auctioneer. 5. Auction Item Bid/Message History - Current auction item bid history and any messages associated with current auction item. 6. My Watch List - Displays any auction items you have added to your watch list. 7. Bidding Overview - Overview of the current item’s high bid, current bidder, and status of item. 8. Bid Button - Shows the asking bid along with the bid button. 9. Special Announcement - Green bar displays when new information needs to be shared. 10. 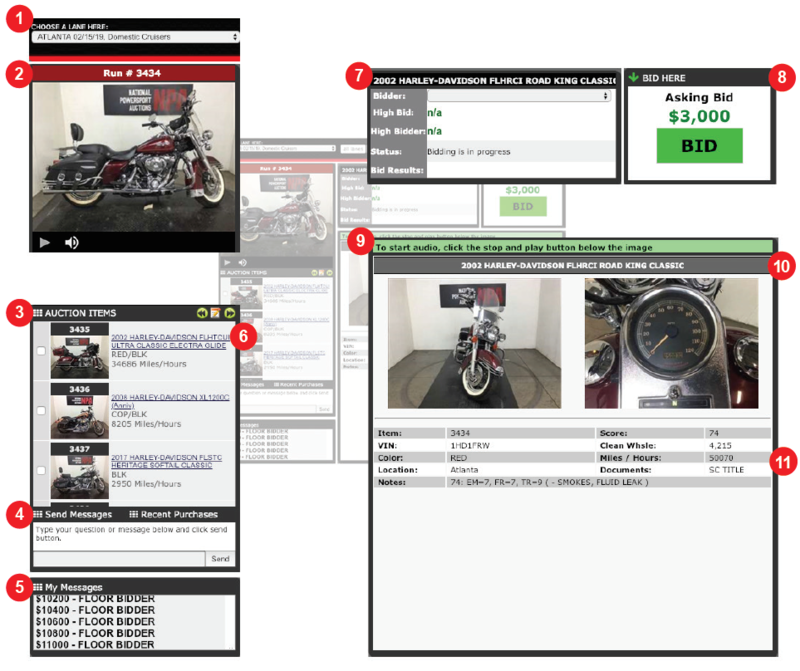 Auction Item Overview - Displays the current auction item’s condition report, auction notes, and vehicle images button. 11. 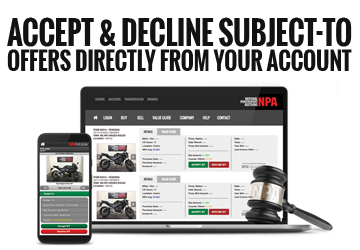 Condition Report - Lists the necessary information about the current auction item including item #, year, make model, item location, miles, condition report, and type of title. We noticed you are using Internet Explorer - IE! IE does not support some of the HTML5 features required by the bid Client and thus it is HIGHLY RECOMMENDED that you switch to Google Chrome or Firefox before opening the Bid Client. Click "OK" to open the Bid Client and confirm your understanding that the Bid Client might not work as expected using Internet Explorer (IE) if Adobe Flash is not current.